Note from Johnson Level: This review by Tom Hintz at NewWoodworker.com explains many of the benefits of these two power tapes. Both the Stud Squared and the PlanReader are very versatile and were designed to save the user time and money. For this reivew in it's original form click here. It isn't often that we see so much utility and quality in tools that are priced so low. I expect that is not an accident! There is nothing new about the retractable measuring tape concept but Johnson Level and Tool has been able to conjure up two new models that fit two areas of need – in addition to being regular tape measures. The PlanReader® Architect Series Power Tape makes bringing a blueprint or scaled drawing to life easier and more accurate. 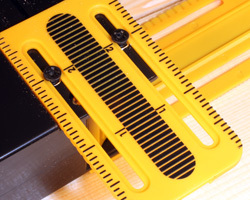 The Johnson Stud Squared tape measure lets you work with common framing materials faster and easier without carrying around extra layout tools. Since woodworkers are often the installers of their projects and free home improvement “contractors” these new offerings from Johnson Level and Tool are of interest to us. For those who frequently work off of scaled plans or blueprints the PlanReader® Architect Series Power Tape can make your work go faster and more accurate all at once. While the feature making this possible is sort of hidden you won’t forget where it is once it demonstrates its usefulness. The PlanReader® tape has a conventional-looking case (left) complete with a rubber over mold and easy to read markings on the wide tape. Turn the tape over (right) and the 1/8 and 1/4 scale markings can make life with a scaled drawing or blueprint much easier! The 33-foot model #1819-0033 and 25-foot model #1819-0025 each sport a 1-1/16"-wide blade. The 16-foot model #1819-0016 has a 1"-inch-wide blade. All of them feature exceptionally clear printing and large-scale numbers and markings that are easier to read in a wide range of conditions. Johnson gives all of their metal tapes their Blade-GardTM nylon coating that helps them to resist the abrasions encountered on all job sites. The body of the PlanReader® Architect Series Power Tape has a rubber over mold that both helps protect the tool itself and makes it easier to grip. That same over mold also helps prevent marking of sensitive materials. The locking slider seems a bit oversize but that makes it easier to use even with gloved hands. You have to turn the PlanReader® Architect Series Power Tape over to see the special feature. An equally clear set of scales in resolutions of 1/8” = 1ft and ¼” = 1ft are printed on the bottom surface of the tape making it simple to measure right off of scaled drawings or blueprints and translate those numbers to the correct dimensions on your work pieces. That means you can skip the mental calculations and still get it right the first time. That makes your work go faster with less scrap. Both of those are especially important to contractors but also to the DIY community that likes to do quality work and save a buck whenever possible. Of course the PlanReader® Architect Series Power Tape also functions just fine as a regular tape measure when plans or blueprints are not part of the days projects. 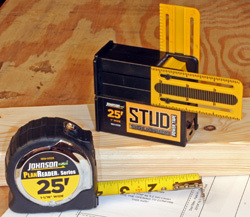 The Johnson Stud Squared tape measure (left) has an easy to read tape, a purpose designed body and slide-out extensions that can be used to draw very quick square lines (right) on common framing stock as well as many woodworking project parts. 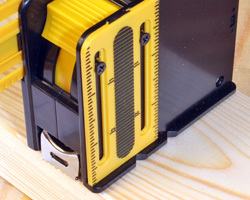 Visually the unique features of the Johnson Stud Squared tape measure are easy to spot. 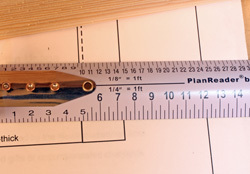 The case dimensions of 1-1/2"-wide by 3"-tall and 3-1/2” long will sound familiar to anyone who has done framing as they relate to the size of common materials used to build virtually any structure. 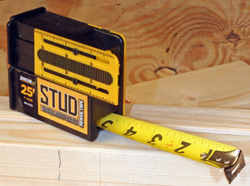 The case also has lips built in that let you use the Johnson Stud Squared tape measure as a square to handle common layout lines with a new speed as well as accuracy on materials up to 2” by 12” stock. Plus, the case is sized so that it fits in the same tool belt pocket that will hold a more common 25’ tape measure. The 25-foot-long blade is 1”-wide and has extra large numbers and high-end printing to make reading the markings easy in even not-so-bright conditions. The case also has centering V-notches that correspond with single and double framing members, simple 2 by 4 walls partition construction and even common double microlams. The Johnson Stud Squared tape measure has two sliding rule extensions that make drawing accurate layout lines easy. Combined with the lips formed into the case these lines are also very square. The sliding extensions have 3”-long scales with 1/16” resolutions and stay very square to the case because of a dovetail guide built into the case and the back of the extensions. That dramatically limits wide-to-side deflections. The case (left) has notches for finding center on common framing materials. The slide out extensions (right) have easy to read 1/16" graduations. These extensions are very stable thanks to a dovetail slide on their back side. If all you do is measure and cut boards for projects the features of these Johnson tape measures may not be important to you. However, most woodworkers also do installations of the things they build and remodeling projects (large or small) where the capabilities of these tape measures can be very useful. 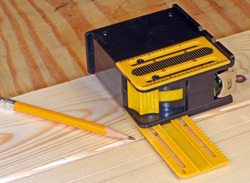 Because both of these tools have regular tapes in addition to their unique features so you do not sacrifice simple layout capabilities so both of these tapes can be used for day-to-day woodworking chores as well. Both of these tape measures are well built and simple to use. Once you understand what they were designed to do, employing those special features is easy. Because Johnson Level and Tool has so much experience and manufacturing horsepower in this field the accuracy of the tape graduations is without question. While I do not advocate throwing any measuring tool around we all drop stuff on occasion. I inadvertently “stress tested” both the Johnson Stud Squared tape measure and PlanReader® Architect Series Power Tape during the evaluations with neither showing any damage. Both continue to work perfectly but I will strive to be more sure-handed in the future. I don’t use scaled plans or blueprints much but gave the PlanReader® Architect Series Power Tape a try anyway. It really is simple to measure a part or even the distance between parts or features on a scaled plan and then accurately translate that to the full-sized project. One of the reasons I have not used scaled drawings much is remedied by the PlanReader® Architect Series Power Tape so now that I have one I may expand my project horizons accordingly. The Johnson Stud Squared tape measure turns out to be very useful for even typical woodworking around the shop. Being able to measure a dimension, slide out the extension and convert that mark into a square layout or cut line with one tool really does save time and the clumsiness of carrying around both a tape and a square. If you do more framing type work regularly or as part of your woodworking the Johnson Stud Squared tape measure is even more useful. The PlanReader® Architect Series Power Tape and Johnson Stud Squared tape measure are well made and thoughtfully designed to be useful in a range of woodworking-related chores. Johnson has a way of coming up with useful ways of enhancing measuring tools and these two are good representations of that kind of product development. I like how they retain the original tape measure function along with the new features so the end user need not buy two tapes. 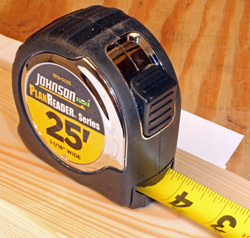 With notably low street prices of just $9.00 for the PlanReader® Architect Series Power Tape and $12.99 for the Johnson Stud Squared tape measure (6-6-2011, both being 25’ tapes) these tools can bring their capabilities to your shop or job site on the cheap. With pricing in the woodworking marketplace always seeming to be trending upwards it is refreshing to see a group of quality tools that are so reasonably priced yet have utility in the woodworking community. All that is left is for you to decide which one suits you both (naturally they both seemed to suit me….) so you can plunk down a refreshingly low number of your dollars to own it – or them.